In this future fashioned for the 9-12 set, Alice Dare (not Alasdair) is the very normal daughter of the world’s most famous fighter pilot. The world has been invaded by invisible aliens called Morrors who want to turn the Earth into a never ending ice age. They like it cold, see. 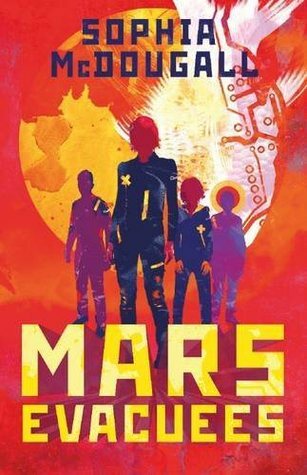 McDougall blends clever wit and loads of fun to bring this tale where 300 kids are evacuated to Mars ahead of the ongoing Morror invasion, just in time for it all to get worse. Endlessly inventive, this book deserves to be right at the top of your book-buying list. I’m starting a new project, to keep me scribbling on this blog. It’ll be completely random, as well as revealing a bit of the subject matter of what I’m currently reading. Here’s the thing: I hate book reviews. I want to like them, and they always start off interesting, but then they devolve into meaningless drivel where the review writer wants to show off their writing skills. I get it. It’s hard to say “this was a good/bad book” in an interesting way, again and again, along with enough content to give you an idea of whether or not you actually want to read the bloody thing. Some folk I know have been experimenting with 30 word reviews – a la Twitter- which is excellent, but I want a bit more meat. I’ve met Sophia McDougall, and she’s lovely, with what turns out to be a borrowed teeny hat. She wrote a brilliant story for Pandemonium: Stories of the Apocalypse which had me sit dreaming for days, excited to start her full-length novels. Romanitas: Rome never fell, and there’s a love-and-politics story happening now. It gave me a bit of trouble. Fabulous ideas, well-researched, innovative, and there’s this thing that McDougall does with a shifting POV that’s brilliant if sometimes disconcerting. The plot suffers from some stops and starts, but bits of utterly gorgeous prose crack through. File it under “Very-promising start”.